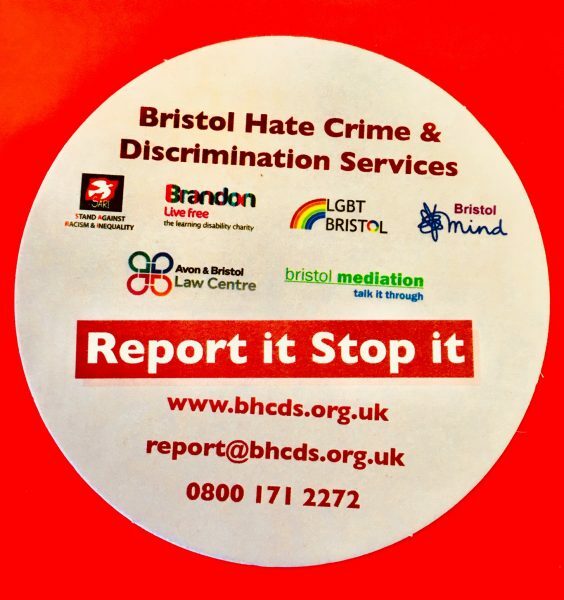 Bristol Hate Crime & Discrimination Services (BHC&DS) is a partnership of six organisations, who work together to get the best outcome for you if you have been a victim of hate crime or discrimination. Discrimination is when someone is treated differently for these reasons (including pregnancy and maternity). SARI is the race/faith and hate crime specialist. They coordinate the Bristol Hate Crime & Discrimination Services. LGBT Bristol supports people who have been the victims of homophobic, biphobic or transphobic hate crime. Brandon Trust specialise in supporting disabled people and tackling disability hate crime. Bristol Mind supports victims of disability hate crime due to their mental health, and promotes better mental health for all. Avon and Bristol Law Centre help people with complex cases involving the law. Resolve West are able to work with people to resolve conflict and repair harm through direct or indirect communication.